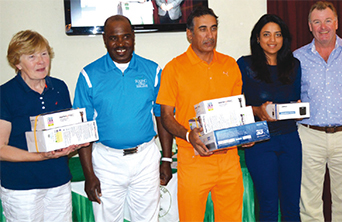 Roshni Khanna came out tops in a tight struggle at Awali Golf Club’s Bapco-sponsored stableford event held last Friday. In a close competition, the top four places were decided on countback. 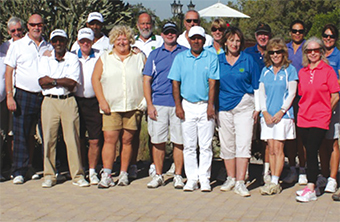 The warm and sunny conditions were spiced up with a blustery wind and the scores across the board reflected the tough conditions. Nevertheless, four players came in with 39 points and the top 10 were at par or better. Vice-Captain Bill Scarth performed the post-match ceremony and highlighted a most unusual incident. A player on the 8th tee hit a beautiful shot and landed on the 8th green – in itself unusual for the average golfer! At the same time another player teeing off on the 9th, hit a less successful shot and also landed on the 8th green. Even more bizarrely both players were using the same brand of ball with the same number and with the same club logo. Sadly, both players managed to play the wrong ball and incurred the due penalty – a lesson for all players to put an identifying mark on their ball. Results: 1st Roshni Khanna (39), 2nd Reynaldo Alejandro (39), 3rd AR Mohammed Amin (39), 4th Abdulla Sultan Faraj (39).